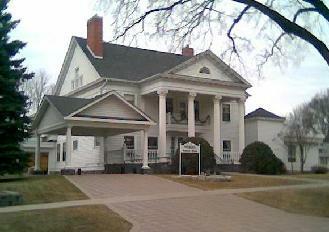 One of the largest Greek Revival homes in North Dakota, it was built in 1899 by Hiram R. Lyon and was and still is considered an outstanding home of the City of Mandan. The foundation, about 2-1/2 feet thick, is of field rock. Builders used tongue-in-groove subsiding in a diagonal pattern on the outside wall to strengthen the structure. All of the wood was hand cut and much of it had to be ordered specially for the home. When Mr. Lyons built the house, the woodwork was corner sawed white oak. The cabinets in the dining room and the wainscoating was handpainted. Mr. Lyons also had a table and chairs made to match the woodwork. The table seated twenty people. The house is patterned after southern plantation homes, with massive pillars along the front and at that time included a porte-cochere, the French term for a carriage drive. Passengers were free to enter and disembark from their carriages under the protection of the driveway roof on the south side, away from the winds and snow. Hiram R. Lyon came to Mandan in 1881 and the 25 years he spent here until 1906-07 were filled with business activities, ranging from the presidency of the First National Bank to founder of the the Mandan Mercantile Company. He also had an active interest in the Mandan Roller Mill and the North Dakota Milling Association. He engaged in the raising of sheep and was responsible for the placement of thousands of head on Morton County farms, on shares. Other business he established were the Missouri Valley Milling Company (whose premium grade of flour was called �Lyon�s Best�), the Mandan Electric Company, the Mandan and North Dakota Independent Telephone Companies, and the Missouri Valley Grocery. The home was sold in 1907 to George and Margaret Bingenheimer. Bingenheimer was a prominent local businessman who had established a major lumber and machinery outlet as well as the town's first drug store in 1881. The photo (SHSND C1501) provided shows the Lyon Home c.1906 with their horse-drawn carriage and is used with permission of the State Historical Society of North Dakota. In 1956, the house was remodeled to be the Hoenig Funeral Home. The building was updated in the 1980�s by Tom and Kathy Weigel who own and operate the home today. Prior to the most recent modifications, they went through an extensive effort so that the new addition on the north side of the building would "tie in with the style and the feeling that was already there." The design of the columns, the bacony rail, the gable end of the roofs and all the trim pieces were carefully copied from archeologists' report of the original design.